I think you can smell what the Rock is cooking: a dish that'll fatten your head but pleasantly plump your gut. 104 min. Universal. Director: Peter Berg. Cast: Dwayne 'The Rock' Johnson, Seann William Scott, Rosario Dawson, Christopher Walken, Ewen Bremner. Okay, here's The Rundown. You got your Seann William Scott, you got your Christopher Walken, and you got your the Rock. Throw in Rosario Dawson for good (ogling) measure. Baste liberally with bone-crunching stunts and suspiciously familiar headlocks and tosses. Half-bake some Indiana Jones action, and I think you can smell what the Rock is cooking: a dish that'll fatten your head but pleasantly plump your gut. If The Rundown succeeds, and I suppose it does by the skin of its teeth, it's by throwing a little of everything into the pot. Director Peter Berg (the sometime actor who helmed the self-confident black comedy Very Bad Things) here channels Jerry Bruckheimer's school of rock, dicing each scene--and particularly each action sequence--into addictive "once you pop, you can't stop" crumbs. Berg and the Rock prove immediately simpatico in an opening sequence which puts the star in convincing elements: a hot-spot nightclub, a mock-serious dilemma involving an ultimatum for a football team's entire defensive line, and a flatteringly upscale suit. The ensuing strobe-lit, quick-cut knockout, drag-down fight is piecemeal but propulsively charged nonetheless. Did I mention California Gubernatorial candidate Arnold Schwarzenegger gives the scene his (timely) on-screen blessing? The Rock's collection agent/bounty hunter/aspiring restaurateur Beck proves to be a videogame Street Fighter come to life (as Walken says, "You got the moves, I'll give you that."). When Beck's boss makes him a parting offer he can't refuse--"One job, I wipe your slate clean, and you have your restaurant"--the big lug hops the next duct-taped plane to Brazil to nab the boss's wayward son Travis (Scott), a self-serving treasure hunter. There, Beck runs afoul of evil slave driver Hatcher (Walken) and the rebel forces with whom Hatcher is embroiled in conflict. Dawson's mysterious and lippy Mariana--somehow invested in the conflict--effortlessly turns the heads of Beck and Travis every time they cross paths. Did I mention the two boneheads get more action from a bevy of horny jungle monkeys? 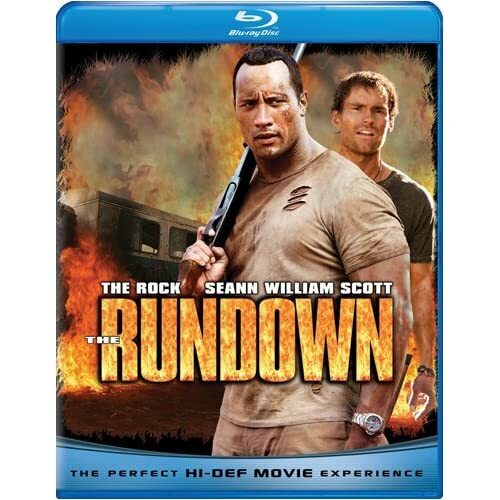 In its Blu-ray debut, The Rundown comes with an very strong transfer preserving its hyper-stylized color in a clean and detailed image; it's supported by a perfectly robust DTS-HD Master Audio 5.1 mix. 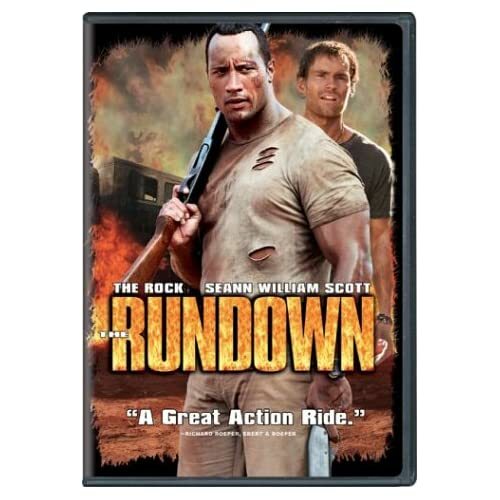 As on DVD, The Rundown comes with two bonus audio tracks: an entertainingly jokey, male-bonding commentary with The Rock and director Peter Berg, and a more run-of-the mill commentary with producers Kevin Misher and Marc Abraham. "Deleted Scenes" (13:50, SD) are actually largely extended scenes, but there are plenty of gems here, including amusing trims of Walken and Ewen Bremner and even a bit more action. "Rumble in the Jungle" (10:32, SD) gives us a look at the film's production, with Berg, The Rock, Scott, Ernie Reyes, Jr., and Rosario Dawson. "The Amazon, Hawaii Style" (5:27, SD) focuses on the beautiful but sometimes trying location; Berg, Misher, The Rock, Scott, Dawson participate. "Appetite for Destruction" (8:20, SD) gets into the film's outsized action, with special effects coordinator Burt Dalton, The Rock, and Dawson. "The Rundown Uncensored" (6:08, SD) is a mockumentary goof about working with the baboons. Participants include baboon trainer Kevin Keith, Berg, The Rock, and Scott. "Running Down the Town" (4:09, SD) collects observations from production designer Thomas Duffield, producer Karen Glasser, Misher, The Rock, Abraham, Christopher Walken and Dawson about the elaborate El Dorado set, while "Walken's World" (5:33, SD) honors the weirdest actor walking. Walken, Duffield, Berg, and The Rock chat for the camera. The disc includes Universal's My Scenes functionality, with a BD-Live hook-up to share clips online. All site content © 2000-2019 Peter Canavese. Page generated at 04/17/2019 04:14:23PM.